Having featured the Ashy Drongo earlier, this time I have a few images of the Greater Racket-tailed Drongo (Dicrurus paradiseus) to share. They are distinctive in having elongated outer tail feathers with webbing restricted to the tips. These are one of the larger Drongo species and usually have a prominent crest (which is missing in the bird featured here). The racket is tear-drop shaped and on one side of the shaft only. 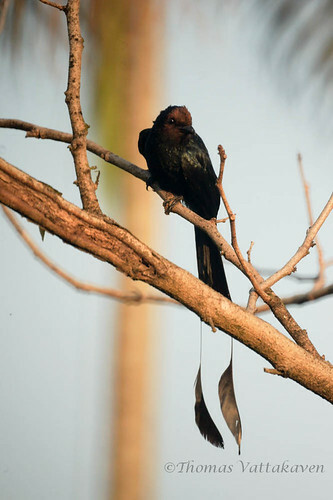 These drongo’s are notorious for their mimicry skills and very vocal birds.